Benefit from flexible working hours, job security and an attractive salary with this enjoyable and rewarding career choice. Our training course has been running successfully over a number of years and is conducted by a highly experienced driving instructor trainer. Most of our instructors teaching within the driving school have been in-house trained. To become a Driving Instructor a candidate must pass three tests. A candidate must understand to qualify and gain the professional qualification of a driving instructor he or she must be prepared to work hard at each section of the qualification process, the required standards are extremely high. There is no short cut to gain your green badge. The training is all on a ‘one to one’ basis, although you may on some occasions be invited to observe on other trainee’s training which may be a benefit to both parties. (Only with prior agreement from other trainee).Your training will be conducted by the same trainer to maintain continuity and to give the personnel touch you may not receive from other training establishments. Payment for training is conducted on a ‘pay as you go’ basis normally but a full course price can be supplied on request.’ Pay as you go’ means the candidate has no large upfront payments to find and they can also keep a track on their finances(no confusing payment plans and no borrowing large amounts of money you may not be able to pay back).You only pay at the end of each training session and then rebook to suit yourself. A structured training programme has proven more effective than the intensive courses offered by some training establishments. First stage: Informal meeting with trainer. A short informal meeting will be arranged at our main office. This is to discuss the training process and to answer any question (No cost to candidate).If a candidate is interested a assessment session is arranged. The trainer will discuss your performance and answer any questions you may have. You may at this point if you a more than happy to proceed with the training book your first part 1 training session, we understand that you may require time to think about it or to discuss with close family or friends, you can rest assured that you will not receive pressure from phone calls or by post. Theory training is conducted at our office and is usually hourly. Classroom training is charged at £33 per hour. You will be advised by your trainer when to book your Part 1 test. A cost of £81 is payable to the Driving Standards Agency for the test. All training for Part 2 is ‘in car’ training and most candidates will use their own car to aid with private practice. Although school cars may be used if required at No extra cost. The cost of part 2 training is charged at £33 per hour, larger sessions maybe required. Remember: You only have 3 attempts at the test. MSPSL, turning left/right at junctions, emerging. Progress, rural roads, forward planning. Overall assessment. (Book test if required standard is reached). Private practice is essential if required standard is to be reached promptly. You will be advised when to book your test by your trainer, a fee of £111 is payable to the DSA for the test. The final test of the qualification process is Part 3 the test of your ability to instruct. This test will last approximately 1hour, 30mins for phase 1 (beginner/partly trained stage) and 30mins for phase 2 (trained stage/full licence holder). Part 3 is renowned to be the most difficult of the 3 tests to pass, so a high standard of training is essential to give a candidate the best chance of success. This is why all part 3 training is ‘in car’ and on a ‘one to one’ basis although on some occasions a candidate maybe invited to observe a training session if it’s thought it could be of a benefit(there will be no extra charge). Training on part 3 can be intense with lots of information to take in so it’s recommended that the training sessions be recorded for future reference, this can be achieved by either a candidate using their own Dictaphone or bringing a blank cassette tape (recordings are for personal use only). A 90mins training session has proved to be the best length of time for a training session for part 3 training, an hour tends to be too short and 2 hours can be too long, but we are happy to do any length of session a candidate requests. Explanation of marking system, identification of faults and identification of good driving. Starting a lesson, establishing previous knowledge. Conducted under part 3 test conditions. The cost of a part 3 test is £111 payable to the DSA, this is the responsibility of the candidate. Remember you only have 3 attempts and these attempts are extremely precious. When a candidate has completed a minimum of 40 hours of part 3 training they can begin to teach on a trainee licence (a pink) to gain experience and to develop the skills to give them the best possible chance to pass their part 3 test, at Safe 4 Life we can offer this opportunity and this will be discussed with the candidate at the appropriate time. Part 2 / Part 3 Rescue Training. 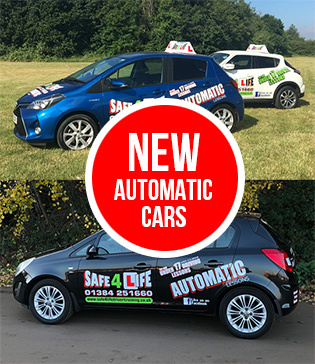 We understand there are any number of training establishments offering training and sometimes things don’t work out for many reasons but at Safe 4 Life driver Training we can offer you a high level of training and a personal touch that you may not get from other training establishments. Your success is our main aim and you will get all the help and support needed from all our Driving Instructors and you’ll be treated has part of the team. For more information on training with Safe 4 Life Driver Training.